Why does Houston Flood so often? With Hurricane Harvey on the way, Houstonians begin to prepare. Stocking up with water, food, supplies and preparing their properties for the oncoming storm. In recent years, Houston and surrounding areas have experienced a climatic trend of becoming both warmer and wetter. Houston receives approximately 50 inches of rainfall per year (June being the wettest month with an average of 6 inches). According to the National Weather Service, the 18-month period between March 2015 and August 2016 ranked as the wettest on record for the City. Flooding in April 2016 resulted in seven deaths, and cost more than 5 billion dollars in damages. The Houston flood had put 9 districts in a state of emergency and destroyed at least 1000 homes. Harris County is located in the Gulf Coastal Plan, and has a relatively flat landscape. Houston was built around 8 key bayous, having a total of 14 independent legs. Drainage improvements throughout the City were initiated in the late 1930’s. They consisted of measures including reservoir construction (e.g. Barker and Addicks) and modifications to the natural drainage features (streams). A common practice in those days was to widen and straighten the streams in order to increase their flood capacity. This was done to move water quickly downstream and out of the city. The end result would be a ditch (or bayou) with a trapezoidal profile, often lined with concrete. By keeping the flood waters in the ditch, and effectively eliminating the natural floodplain, properties along the bayous could be developed. However, with increasing land development and runoff, there is now a higher potential for waters to cause the bayous to overflow into adjacent neighborhoods. 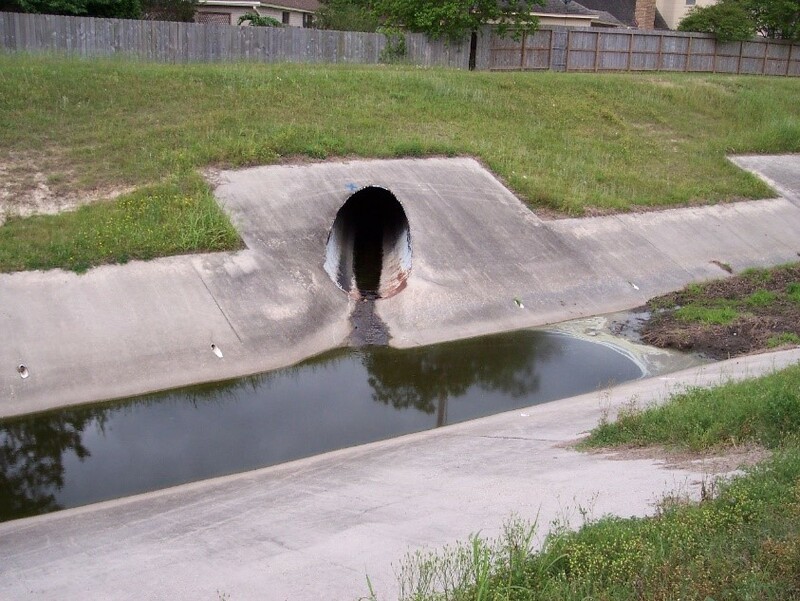 The draining channels constructed in the 1940’s were designed to contain a 4-inch rainfall within a 24-hour period. Back in the 1940’s, this was considered a ‘legendary’ amount of rain. Therefore, this would have set a 100-year record for the city in those early days, and have a 4% chance of happening. Although much of Houston was upgraded in the 1960’s to handle 8 inches of rain over 24 hours, some areas of the City are still only equipped for 4-inch rain events. The current mapped floodplains are shown below. The 100-year floodplain represents those areas having a 1% chance of flooding in any given year. Keep in mind that some of our communities are located in the 100-year floodplain. Figure 2. 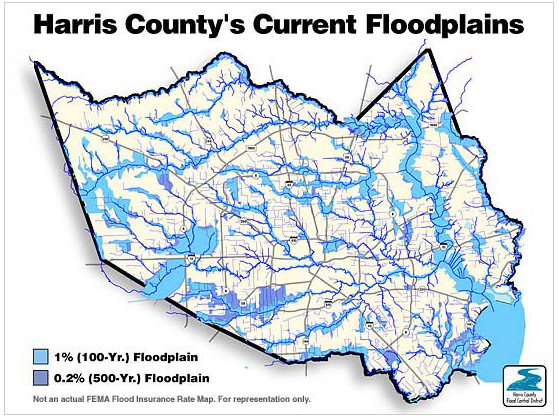 This image was taken from the USAC- National Economic Development Manuals and shows the floodplains of Harris County. Although the simplest solution is to widen bayous through a massive digging project, such a plan is not feasible as nearly 240 billion gallons of rain can fall during a single storm. To put things into perspective, the longest bayou section in Houston is 5 miles long. Using this length and multiplying by 8 bayous, equals 40 miles worth of bayou. That means to accommodate just 1 billion gallons of freshwater, the bayou would have to be widened by over 100 feet, or as tall as a 10-story building! For obvious reasons, such an overhaul is not possible. Aside from the enormous cost and time investment, parts of the bayou would have to be closed while construction work took place and if a flood strikes during this down time, it would compound flooding issues throughout the city. Trying to widen the bayou by more than 10-20 feet would also mean the city would have to buy the houses on the periphery of the bayou which would incur an additional cost. Instead, more practical ways of influencing flood waters need to be sought out. Although, Houston has already come together as a community of engineers, hydrogeologists and floodplain managers to mitigate the issue. There are multiple structural and non-structural flood damage reduction tools that the Harris county utilizes to minimize the damage. Check out the Harris County Flood Control District website to find a wealth of information and become well-informed Houstonian. Latitudes Environmental is a Houston-based environmental consulting firm, focused on land and water planning. With an increasing rate of development throughout our region, and Houston possibly overtaking Chicago as our country’s third largest city, Latitudes believes that flood management will offer both challenges and opportunities. If you or your business was flooded by Hurricane Harvey, We can help with the remediation process. We specialize in Mold Assessments, which will be required by insurance companies, that show a clean bill of health for the property after the remediation process is complete.